The Documents utility allows users to upload, store and manage key employee and HR related documents securely in BrightPay Connect. It can be used for example to upload employee documents such as individual contracts of employment, handbooks, appraisal documents, company pension information, company newsletters and disciplinary correspondence. In addition, users may also like to use the document utility to store employee training certificates and qualification records. All resources that are uploaded can be made available to one or more employees, as required, which employees can then access through their own self-service portal. 4a) Alternatively to upload a link (e.g. to a website) under Links, click Add Link. 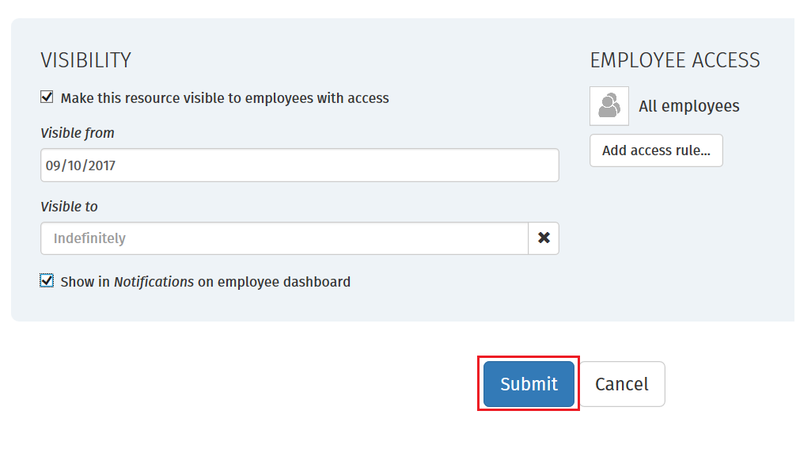 6a) Under Employee Access, click Add access rule... to grant access to one or more employees. b) Select the applicable employee, department or 'all employees' option as per your requirements and click Add rule. c) Click Add access rule... again to grant access to a further employee or department. The resource will now be added to the Documents & Resources dashboard, where it can accessed again at any time. Based on the Visibility and Access Rules that have also been set, the resource will be made available to employees within their self-service portal, if applicable. To manage a resource, simply click on the resource on the Documents & Resources dashboard. To locate a resource, a search facility is provided on the dashboard. To delete a resource, click 'delete resource' at the bottom of the Edit Details screen. Click Yes to delete the resource. The activity log can be accessed at any time to determine emails sent and also to establish whether the resource has been accessed by the employee.